The ultimate in productivity, security & safety. Our powered high-density mobile shelving offer the ultimate in modern storage systems. Our powered systems are flexible enough to handle all of your storage requirements without loading you down with unnecessary features. They are exceptionally safe, productive and secure. Reliability & safety equals peace of mind. Safety is a standard feature in all of our high-density storage systems. Our safety features are all fully automated and do not require interaction to operate. Powered high-density systems are ideal for heavily accessed areas. When activity is detected, the carriages halt movement. The system automatically resets after the aisle is cleared. For added safety, our powered mobile systems can be linked to your building's fire protection and security system. Our powered high-density mobile systems are as easy to use as pressing buttons on an elevator. Powered systems streamline workflow processes more efficiently than mechanical-assist systems - resulting in higher productivity. Aisles can be easily opened allowing simple access to your most frequently retrieved materials. Our powered systems also comply with all ADA accessibility requirements for control height, aisle width and ramping. It's all about access and getting to what you need fast. Simple. Quick. 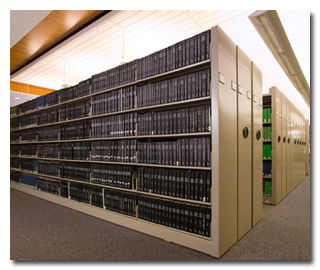 All of your important and confidential materials can be stored safely and securely in our powered high-density shelving. Unauthorized access can be prevented for the entire mobile storage system or even selected aisles. Optional locks allow individual carriages to be key-locked in the closed-aisle position. Our powered systems can also be programmed to automatically close and lock itself. Contact the experts at Franklin Mills to discuss powered high-density storage systems for your facility at 1-888-678-4585.